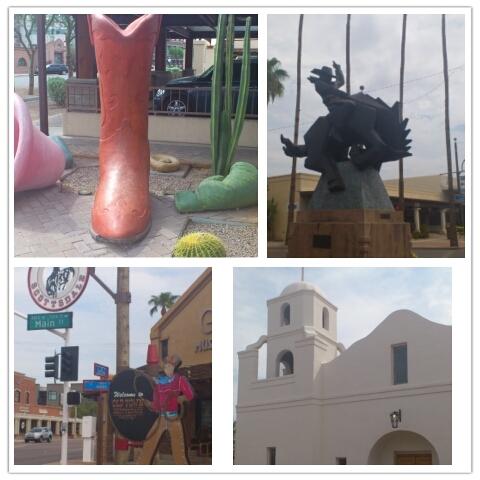 We spent the morning walking around Old Town Scottsdale. Similar to Old Town Albuquerque, Old Town Scottsdale predominantly was a street lined with tourist souvenir shops and art galleries. After some browsing we got too hot so we made a pit stop at Sugar Bowl, which is an old-fashioned soda shop. This shop has been referenced several times in the comic Family Circus. 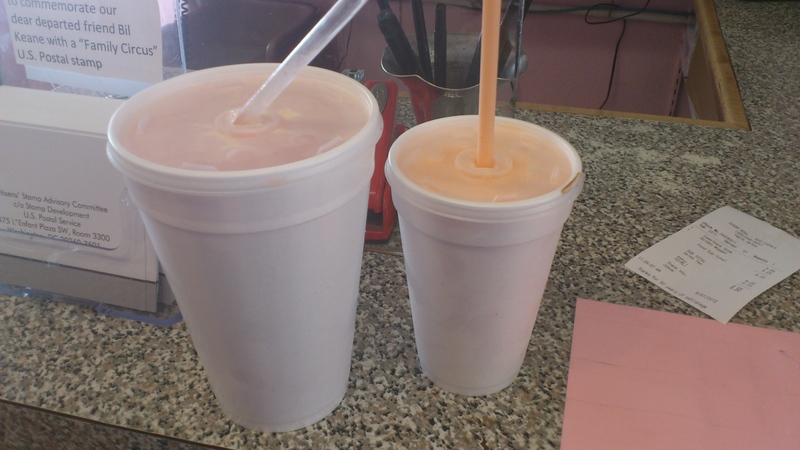 We picked up a couple of ice cream drinks to go. They were delicious on a hot Arizona day (40+ degrees Celsius). With the heat getting more intense with every hour in the afternoon we couldn’t do much outdoor sightseeing we had originally wanted to do. Instead we made shopping stops to cool down in AC rooms. 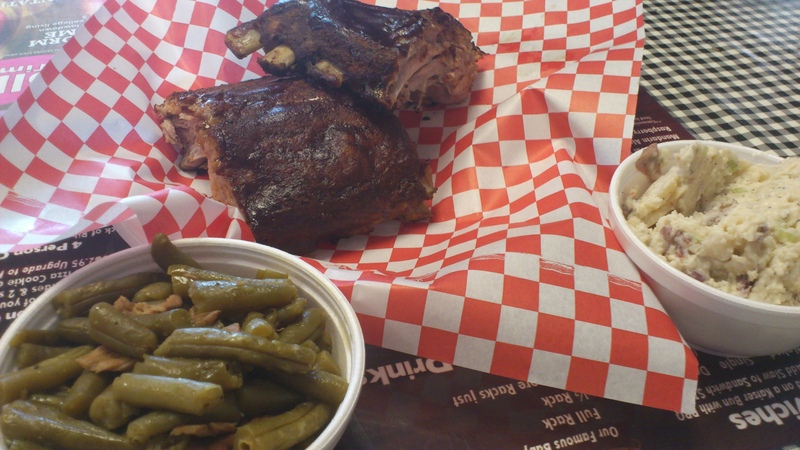 We took a late lunch break at a restaurant called the Ribshack BBQ and shared a 1/2 platter of ribs and a side of potato salad and side of green beans. The ribs were slow roasted for 4 hours and came out tender and moist. They weren’t overly saucy but there were bottles of special BBQ sauces at the tables you could dip your meat in. The green beans were cooked in some spices with small slices on pork. More flavorful than I expected! The potato salad was average. We then headed to Chandler, Arizona just outside Phoenix and 20 minutes from Scottsdale. That evening we were to stay at a friend’s vacation home. 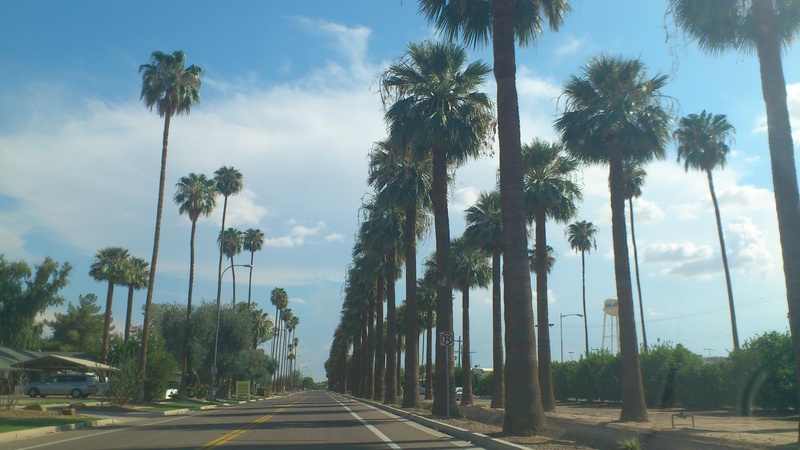 Chandler is an interesting city as it is home to some tech offices such as PayPal, EBay and Intel. There were also multiple gated communities and ritzy shopping areas. We didn’t do a lot of shopping as the tax rate was higher (8.8%). For dinner our friends took us to a chain restaurant called Gordon Biersch. This place reminds me of Yaletown Brewing Co. Our friends recommended their homemade tacos. We ordered a crab and artichoke dip to share. My bf ordered the Cajun fish tacos while I ordered the Seafood Cobb salad. 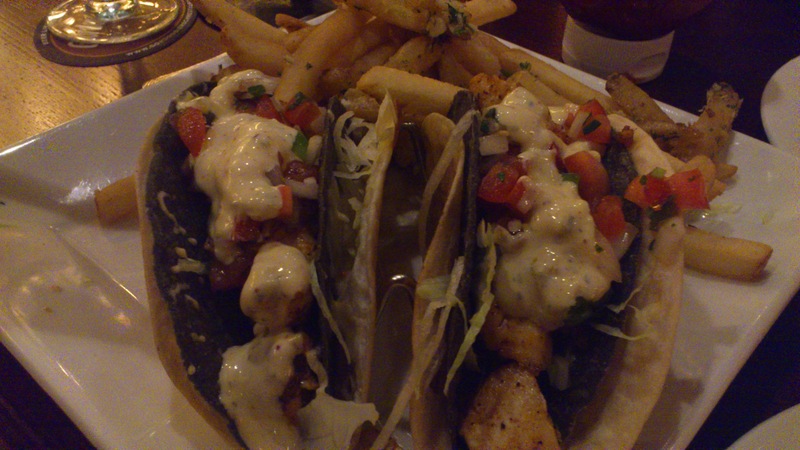 The Cajun fish tacos consisted of a crispy taco holding the fish and lettuce and wrapped with a soft taco, melted cheese in between. I liked the Cajun flavor fish with the cream spicy sauce. My bf ordered garlic fries with the tacos but I found them too garlicky. 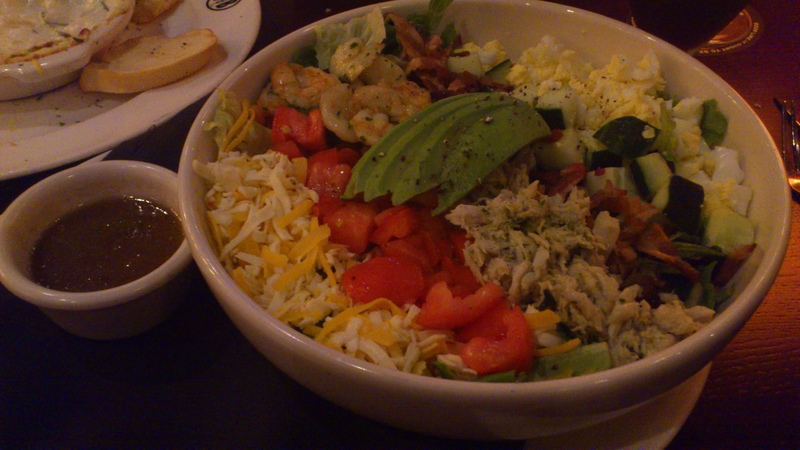 My Seafood Cobb salad was HUGE! It looked like this salad was to serve our whole table. 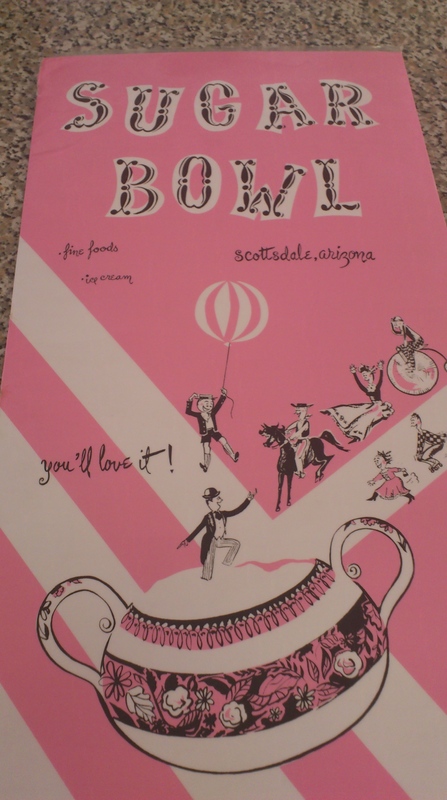 It had grilled prawns and crab meat along with your typical Cobb salad items such as bacon, egg, tomatoes, avocado. My only complaint was the egg was chopped too much. I prefer bigger chunks do I can eat it properly. After dinner we realized it was pouring rain outside so we called it a night and stayed indoor watching the thunderstorm.